(1) Frances Mandley Morris, b. 15 September 1915, Albemarle County, Virginia; d. 08 November 1975, Richmond, VA.
(2) John Lacy Morris, Jr., b. 06 September 1909, Scottsville, Virginia; d. 25 September 2005, Charlottesville, Virginia. John Lacy Morris, Jr., served in the U.S. Army during WWII; to see more information about his military servicce, visit: John Lacy Morris, Jr., U.S. Army. 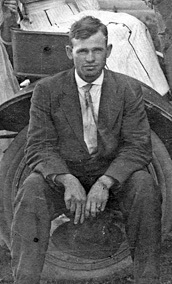 John Lacy Morris, Jr., was the last Morris family member to live at Morrisena, and he never married. (3) James Taylor Morris, b. 08 October 1913, Albemarle County, Virginia; d. 24 May 1997, Lynchburg, Lynchburg City, Virginia. James Taylor Morris married Mary Jane Montanus on 27 April 1943 in Lynchburg, VA. James Taylor Morris also served in the U.S. Army in WWII; to see more information about his military service, visit: James Taylor Morris, U.S. Army. (4) George William Morris, b. 02 July 1911, Virginia; d. 07 November 1984, Richmond, Henrico County, Virginia. 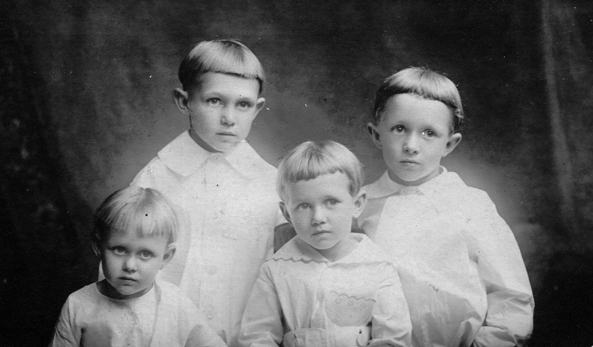 Shown below is a 1910 photo of John Lacy Morris, Sr., father of the above four children. Also below at right is a photo, dated ca. 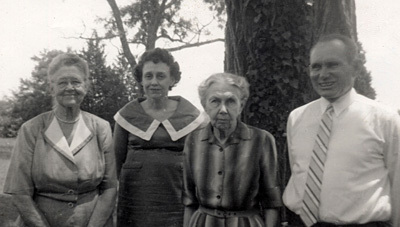 1960, of Daisy Holmes (Callahan) Morris (second from right), who is standing between her daughter, Frances Mandley Morris at left, and son, John Lacy Morris, Jr, at her right. The lady at the left of the ca. 1960 photo was identified on the photo as Susie Callahan, a presumed relative of Daisy (Callahan) Morris. These photos are part of the John Lacy Morris, Jr., collection at Scottsville Museum. In 2005, John resided at Morrisena near Warren, Virginia, and he was the grandson of John Taylor Morris and Lelia B. (Lacy) Morris. John was the last member of the Morris family to reside at Morrisena since it was first granted in 1747 to his ancestor, Hugh Morris, by King George II. John Lacy Morris, Jr., passed away on 25 September 2005 in Charlottesville, Virginia, and he left the Morrisena property to the adult children of his two brothers, James Taylor Morris and George William Morris.